A number of FOLK volunteers undertake butterfly surveys on the Hill and Common. The reasons for undertaking such surveys are given below, followed by a report on results of the survey work in 2015 and 2014. Following entry into Higher Level Stewardship scheme and the change to “extensive” grazing on Charlton Kings Common, it was considered to be important to monitor changes to the flora and fauna to ensure that the management now being applied to the site is improving rather than degrading the habitat. 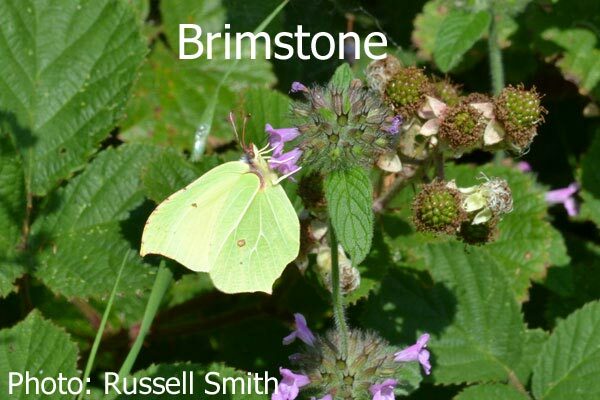 To this end a botanical survey was instigated in 2012 and the following year, 2013, a butterfly monitoring scheme was introduced to complement this. To establish what (diversity and abundance), where (location with reference to habitat type) and when (flight periods) butterfly species are present across easily accessible areas of the whole site over a number of years. Charlton Kings Common east including the Cowslip and Hopkins fields. Each area has been subdivided into sections, roughly equating to habitat type, through which a fixed route is walked by volunteers. For each section, the butterflies seen close to the recorder (within 2.5 metres) are recorded and counted by species. Surveys are done between April and September, ideally every week or two, but dependent on there being surveyor availability and suitable warm and/or sunny weather conditions. 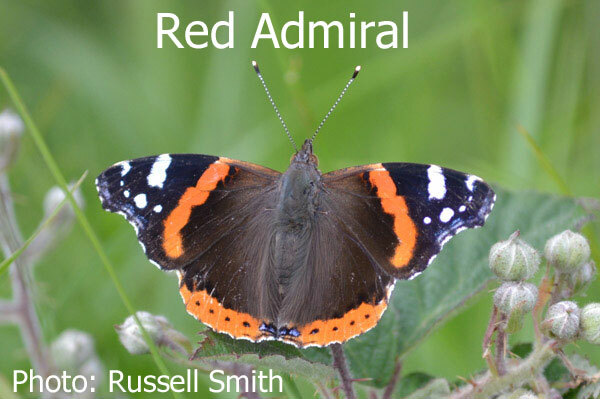 The surveys so far have established where on the site adult butterflies of each species can be found. This has provided guidance as to areas that would benefit from particular habitat management, and corridors are being opened up to ease movement of species across more of the site. Summaries of the surveys undertaken in 2018, 2017, 2016, 2015 and 2014 are included below. This year a stalwart band of 7 surveyors spent in total approximately 85 hours undertaking 57 surveys on 51 different days between 14 April and 27 September 2018. 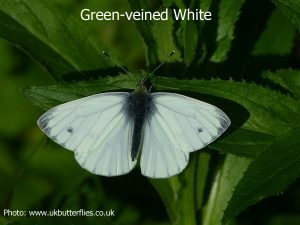 I thank them all for their time and dedication to the task – due to their efforts we are now beginning to get a much better idea of the effects of the management on the site, though of course the weather probably plays a greater role in the short term as to the butterflies’ abundance. Generally, the season got off to a slow start as the temperature at the start of April remained too low to encourage the emergence of hibernators. 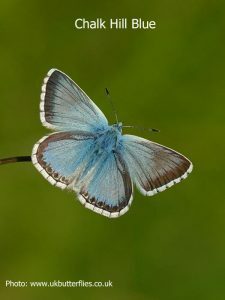 Even the first day on which the temperature in Cheltenham rose to 15°C proved not good enough for any butterflies to be recorded; and on two later occasions the same unlucky recorder drew a blank. 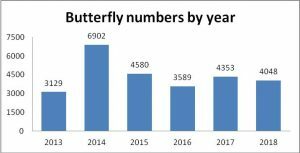 The total number of butterflies recorded this year was 4048, (see chart below) down by 305 (7%) from 2017. At first glance this seems disappointing given the high summer weather conditions when most people had the impression of it being a good butterfly year. However, this number was observed despite ten fewer surveys being undertaken (see chart below). The average number of butterflies seen during each individual survey was 65 in 2017 rising by 9% to 71 per survey in 2018. 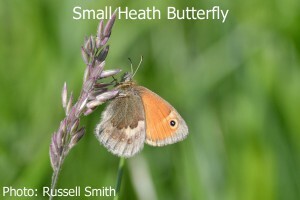 As not all survey routes cover the same distance on the ground and the number of surveys undertaken on each route is not the same year on year, these factors could also have affected the average number recorded this year as butterfly densities vary greatly between the different routes. All in all, perhaps the figures are a little more encouraging, although perhaps not strong enough to indicate that the active management of the site has yet achieved a marked improvement in the habitat for invertebrates. 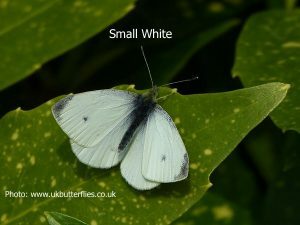 The latter affects the counts in two ways: the high temperatures can make butterflies so active that positive identification of very similar butterflies difficult and so they are excluded from the counts. 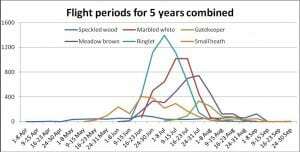 (See the table below) This is particularly true for species such as Skippers (Large and Small/Essex), Whites (Small, Large and Green-veined) and Browns (Meadow/Ringlet). Conversely, some will avoid flying in the very highest temperatures. 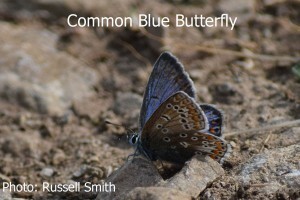 For a more detailed analysis of the weather effects, please see the article at https://butterfly-conservation.org/news-and-blog/cold-comfort. Note 1: i.e. the end of May and mid August. In all other years, missing weeks have occurred earlier and/or later in the year. 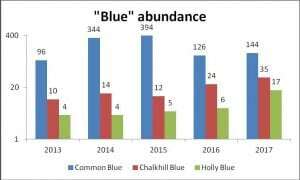 It should be noted that the three butterflies noted in 2018 in mid-August were casual records of Chalkhill Blues seen during a walk rather than a survey. 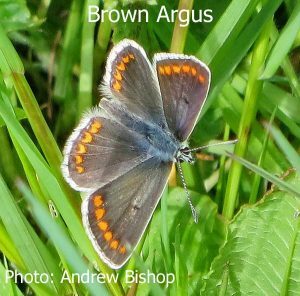 Three species (Brown Argus, Common Blue and Small Heath) have overlapping flight periods with two generations a year – mid May to start July and mid July to start September. Here you might expect some correlation in their numbers year on year. However there is clearly more to it than this, as illustrated in the charts below. 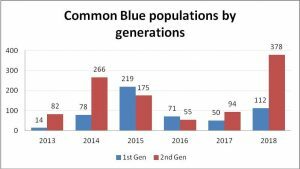 Whilst Common Blue and Brown Argus generally have larger 2nd generations than 1st, this is not always the case as in 2015 and 2016 for the Common Blue, when there were some of the coldest daytime temperatures in June and July (See Chart 7). 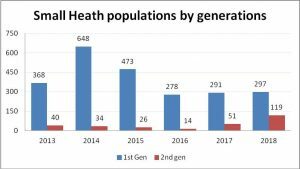 For 2018, it does suggest that the good conditions during and after the first flight period (the warmest May to July in all years) did influence the breeding and survival rate resulting in the largest 2nd generation populations so far recorded. 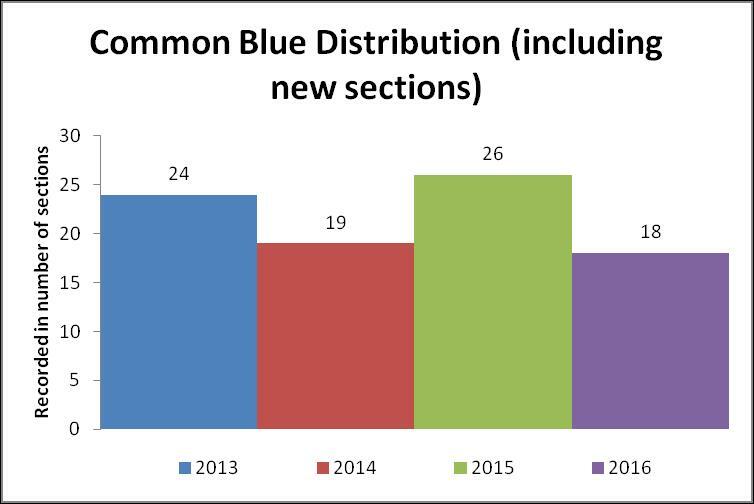 However 2014 was also a numerous year for 2nd generation Common Blue, even though this was not so clearly influenced by early season conditions which were not as hot. 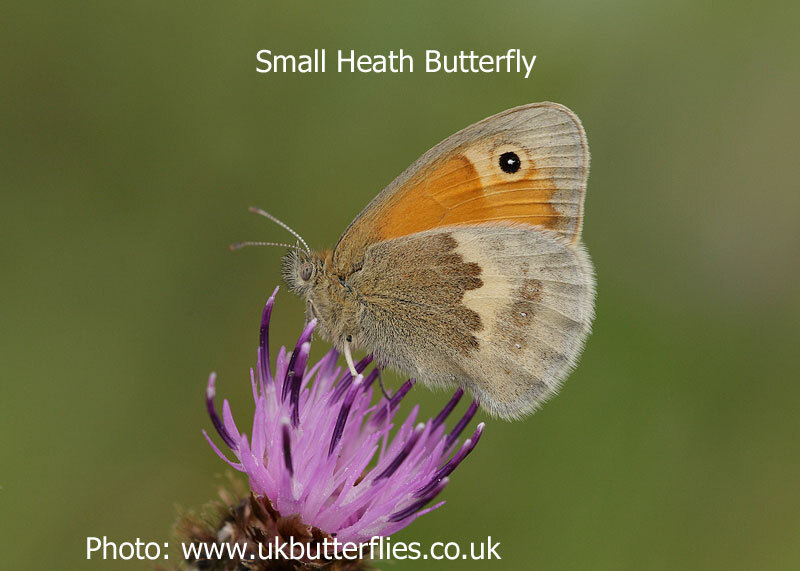 Small Heath only has a partial 2nd generation, with some eggs laid in the 1st developing quickly and emerging as adults the same year, but others delaying to emerge the next. Even so, more than normal seem to have completed their life cycle in weeks rather than months. It will be interesting to see what effect that has in terms of numbers in the first generation in 2019. The main winners in 2019 were Small White, Common Blue, Speckled Wood, Orange Tip, Small Blue and Silver-washed Fritillary, albeit with the last three still in low but increasing numbers. Numbers of Duke of Burgundy were the highest so far recorded, but this was due to additional effort with timed counts undertaken slightly away the normal survey route but through prime habitat, undertaken as part of the Back from the Brink project. 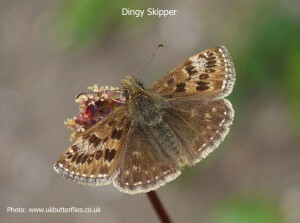 Records of Dingy Skipper, Green Hairstreak, Small Tortoiseshell, Peacock and Dark Green Fritillary continued to decline or stay at reduced levels in line with national trends. (See table below). In my report for 2017, I expressed some concern as to the long term effects of that year’s heavy summer grazing in the area known as Hopkins field. 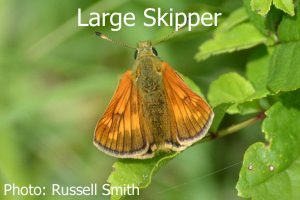 I am pleased to say that apart from Small Heath, and the Dingy and Small/Essex Skippers, numbers have recovered slightly though not up to pre-grazing levels. Unfortunately, there is no obvious increase in numbers on Charlton Kings Common as yet, something to be hoped for in the future with continuing reduced grazing pressure during peak flight time. Analysis of the relative abundance of some species between management regimes, habitat types, and whether grazing within these, noticeably affect numbers seen and therefore inform condition preferences, will be completed shortly and the results will be posted on the FOLK website in due course. Surveying will continue in 2019, and only then will the effects of the 2018 summer drought and unusually high temperatures be revealed. Because of the aspect of much of the site, it did not suffer quite the same desiccation as some other local commons, so hopefully the larval food plants survived long enough to sustain the caterpillars to pupation. Only time will tell. If you would like to help with the survey, please get in touch. Once again, a stalwart band of 8 surveyors spent in total approximately 100 hours undertaking 67 surveys on 48 different days between 3 April and 27 August 2017. 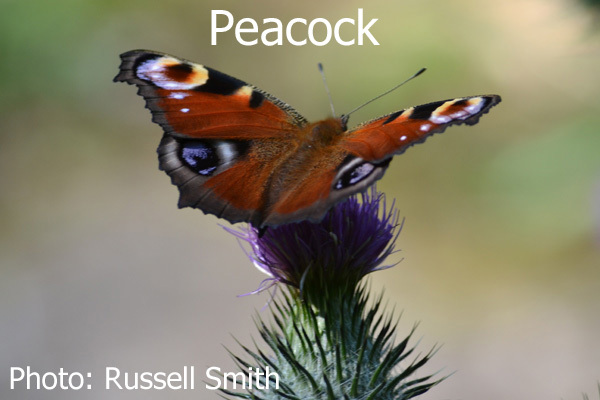 Because of the range and scale of these expert observations we are able to have a good understanding of the diversity of butterflies seen and also the trends in their numbers. Generally, the season got off to an early start, though with notable exceptions for some species namely Large and Dingy Skipper, Small White and Small Heath which emerged about 7-10 days later than previous years. Only once, however, did a surveyor fail to record a single specimen on their route. 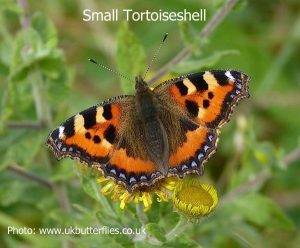 The total number of butterflies recorded was 4354, which whilst more than 2016 was still considerably fewer than 2014 (6902), also bearing in mind that at that time the Hopkins Field was not included in the area surveyed. 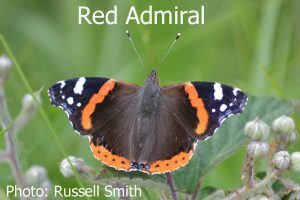 Migrant Red Admirals had a particularly good year (57 in 20 sections), in contrast to Painted Lady (2 only) and no Clouded Yellows were seen. 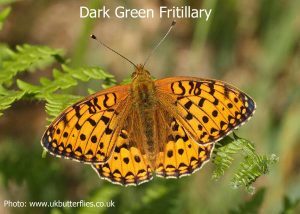 Dark Green Fritillary numbers continued to fall from 49 (in 16 sections) in 2013 to just 7 (in 5 sections) in 2017, though Silver-washed Fritillary have risen from 0 in 2013 to 20 (in 3 sections) in 2017. 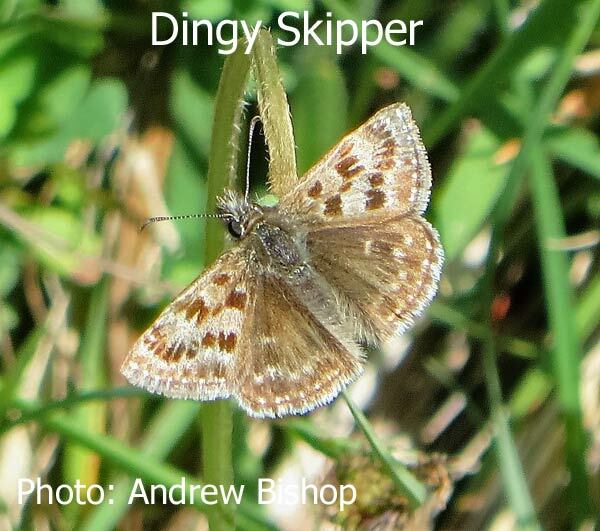 Dingy Skippers reduced from a high of 95 records (in 16 sections) in 2014 to just 14 (in 9). Never very abundant, just 9 Green Hairstreaks were spotted. Small Tortoiseshell was more common than Peacock, but neither was abundant, whereas Commas had their best year in both numbers (34) and distribution (16 sections). No Wall were seen (for the 3rd successive year) so they are probably now extinct at this site. For the first time since the extensive grazing regime was introduced, most of the cattle were not present on Charlton Kings Common for part of the early summer, but instead were confined to the recently fenced area (adjacent to the Cirencester Road and the golf course) known as Hopkins Field. This had a considerable effect on the numbers of butterflies seen in that field, not only whilst the cattle were present, but for the rest of the season as well, due to the almost complete absence of flowering (nectar) plants. 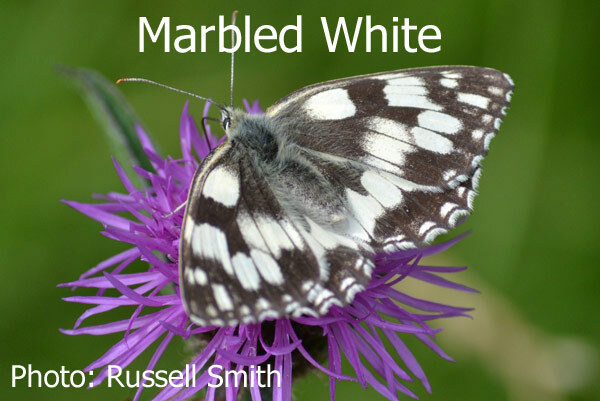 For instance, the numbers of Ringlets reduced from 133 to just 5 (in marked contrast to the increase nearly everywhere else), Marbled White 62 to 7 and Meadow Brown 32 to 17. 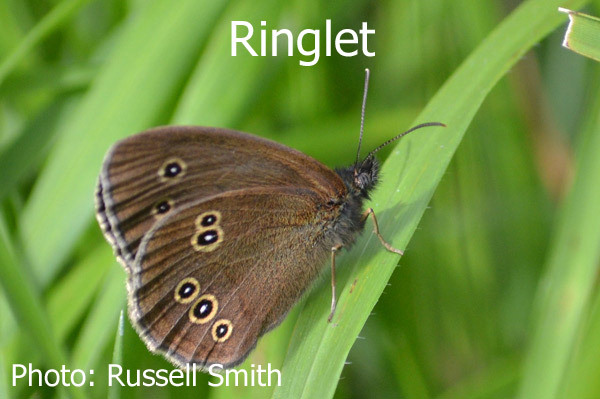 Ringlets tend to have a much shorter, more concentrated flight period (see chart below), with similar rates of increase and decline so were probably impacted more by the intensive grazing. This seemed to have had less of an impact on the species with a longer emergence period with a subsequent more gradual decline because the recovery of the sward from July onwards. 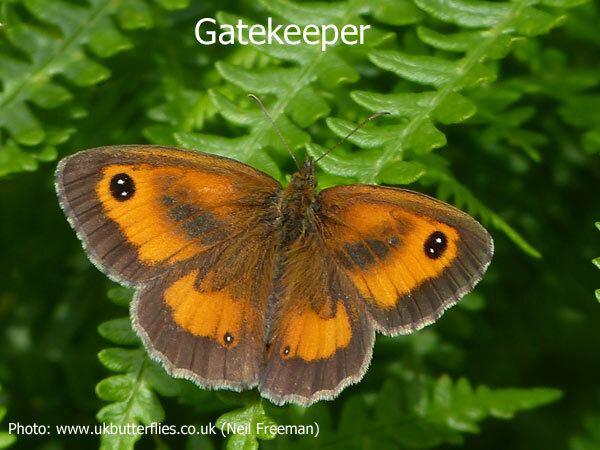 It remains to be seen whether in the longer term butterfly numbers increase on the Common itself due to the reduction in grazing pressure, whereas the increase pressure in Hopkins Field noted above clearly made a considerable difference, to the detriment of populations. The small area on the Common itself from which the cattle had been excluded for two summer seasons failed to show any marked difference in invertebrate numbers in general (butterflies were not counted separately), though the increase in inflorescences (flower heads) was noticeable. Much is made of the attraction to butterflies of Hemp Agrimony, a plant found mainly on the eastern side of Charlton Kings Common, and there are numerous recommendations to include this in any butterfly garden. However, casual observations made whilst undertaking my own surveys showed that the grassland and hedgerow butterflies such as Common Blue, Marbled White and Gatekeeper used bramble, scabious and knapweed flowers in preference. 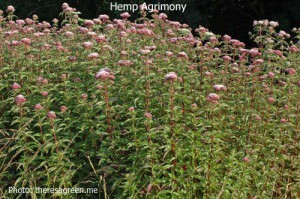 However, the same was not true of the more common garden species (Small Tortoiseshell and Peacock) which did tend to favour the Hemp Agrimony (pictured below). The total number of surveys done this year was 70, on 56 different days, giving an indication of the scarcity of suitable opportunities during the rather poor summer in general. Five of them resulted in no sightings whatsoever. 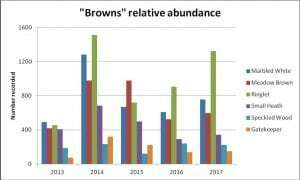 As a whole the season was later than 2014 and 2015, but earlier than 2013. 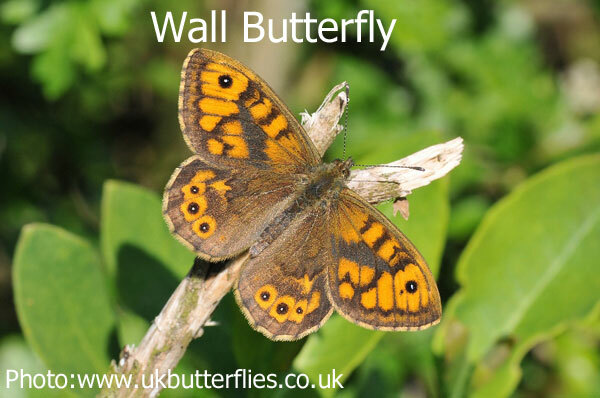 March was particularly cold and wet and with the last frost being recorded on 30th April, it was no surprise that only 13 butterflies had been recorded by the end of that month. After an exceedingly wet June, during which there was a succession of torrential rain storms, often accompanied by thunder and lightning, conditions in July improved markedly. 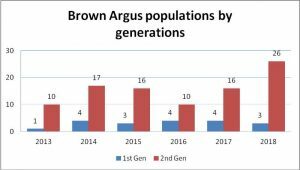 This corresponded with a surge in butterfly numbers boosted as they were by the emergence of the common grassland species (Ringlet, Meadow Brown and Marbled White). 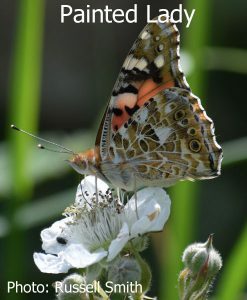 Abundance of butterflies, both on the best day and during the flight period, were the lowest recorded for about half the species, despite the addition of two new survey sections. Some species numbers reduced by as much 90% from the peak recorded in 2014, but most were down by 30% to 50%. Green Hairstreak and Dark Green Fritillary fared worst, though these have never been abundant or widespread over the whole site. 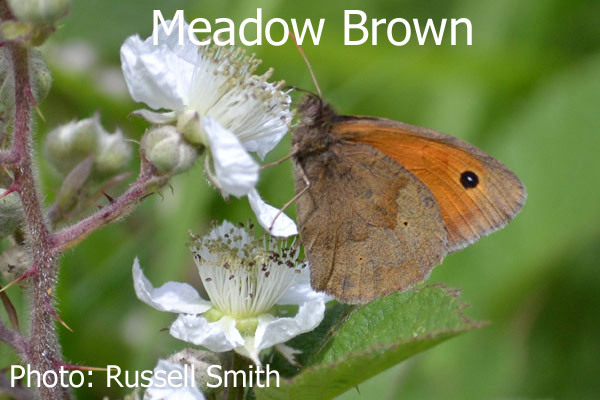 Of the grassland specialists, Common Blue numbers reduced by about 60%, and Meadow Brown and Small Heath were down by 50%, though Ringlet were less affected. 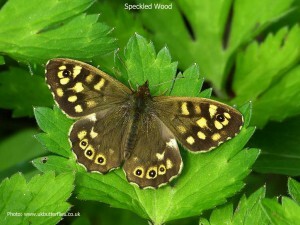 A late surge in Speckled Wood sightings enabled them to buck the trend, recording the highest numbers in 2016 over the years of the survey period. Once again, there appeared to be a further contraction in the distribution range of a number of species. Common Blue, Small Heath, Dark Green Fritillary, Peacock, Small Tortoiseshell and Comma seemed to be the most affected. 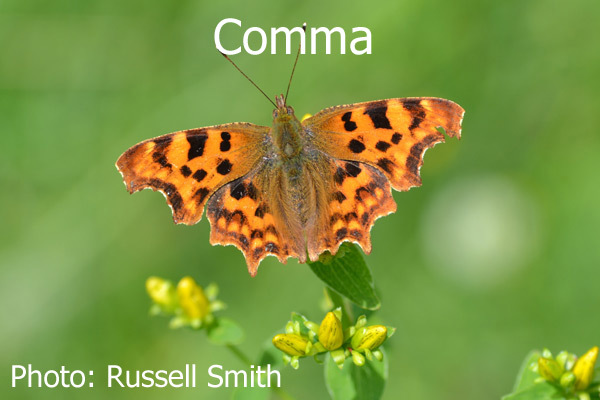 The last three all hibernate as adults over winter, and seemingly had a poor survival rate as few Small Tortoiseshell and Peacocks were seen in the spring and no Commas. By contrast, the number of different species seen in each section has remained more constant where there is limited active management, with the wider variations occurring in the grazed parts of Charlton Kings Common. 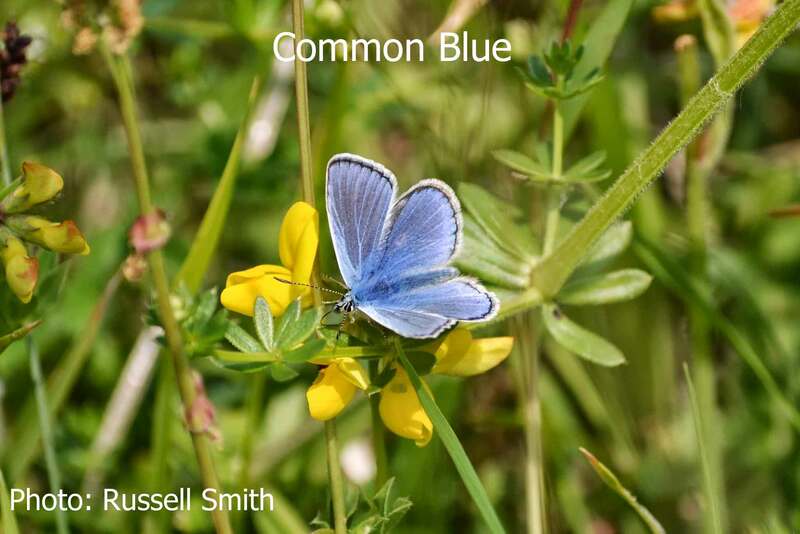 As a good indicator species for unimproved limestone grassland, the distribution and abundance of Common Blue over the whole site for each year the surveys have been undertaken has been analysed. 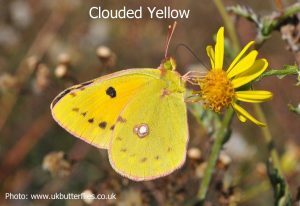 This has identified the sections where the butterfly has been regularly recorded, so is in all likelihood breeding in those areas provided the larval food plant (Bird’s-foot Trefoil) is present. Interestingly, where it is most abundant, there is generally little or no grazing. 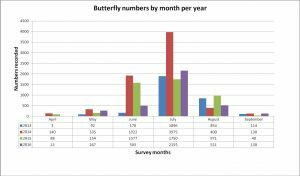 In total 3589 butterflies were identified and recorded between 13 April and 8 September 2016 (4580 in 2015, 6902 in 2014 and 3129 in 2013). The variation over the years (shown in the chart below) most probably reflects poor weather, as periods of torrential rain can decimate adult populations, (numbers take a while to build up again from later emergences) or cloudy, cool and/or windy conditions that are unsuitable for surveying (butterflies will only fly of their volition in sunny or warm conditions). The addition of a new survey area, known as Hopkins field, proved a boost to the overall figures in 2016, in so far as it had a reasonable number and variety of species, despite the lack of management (other than the occasional mow to reduce the scrub encroachment) over the last few years. Sightings included both Dark Green Fritillary, Silver-washed Fritillary, Common Blue, Brown Argus, Dingy Skipper and Marbled White. Whilst the results of the survey indicate a reduction in butterfly numbers (despite the increased survey area), the decrease is unlikely to be caused solely by any particular management action (ash, scrub and gorse clearance) as other sites in the Cotswold on which regular monitoring is done showed similar declines and variations in 2016. However, grazing pressure, especially during peak flowering time (June and July) may well be having a detrimental effect, made worse by the north and easterly aspect of Charlton Kings Common and the generally less herb rich sward due to the dominance of Tor grass of which the cattle are not particularly fond. Action to remedy this situation is now being taken as more land owned by Cheltenham Borough Council adjacent to the common (Hopkins field mentioned above) has been fenced and will be used to reduce grazing pressure on Charlton Kings Common at times. Over the next couple of years it will be interesting to see whether and how butterfly numbers respond to this initiative, both on the Common and in Hopkins field itself. In the meanwhile, with some cold winter weather (this appears to be beneficial to the survival of the early stages of butterfly development) and the anticipation of a warm and sunny season to come, we can look forward to another season. Although there was a slightly earlier start to the season as hibernators (Small Tortoiseshell, Peacock and Comma) emerged on a warm bright day at the beginning of April, later the weather often failed to play its part helping to make surveying a rather frustrating occupation. Otherwise the flight periods of most species followed in a similar pattern to 2014 and earlier than 2013. Peak populations (the highest number counted on a single day) of Common Blues, Large White, Meadow Brown, Brown Argus, Small Tortoiseshell, Speckled Wood, Gatekeeper and Small Heath were the highest recorded so far (in 3 years) though this was more likely to reflect the generally poor weather which encouraged all the recorders out on the one and only suitable day of the week than an actual increase in butterflies! 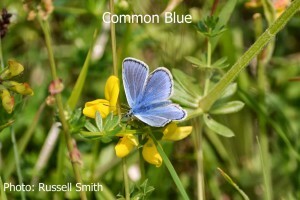 Only Common Blue exceeded the previous highest total recorded in a season. Overall numbers were lower in 2015 (4580) than 2014 (6902). A direct comparison with 2013 (3129) is not possible due to a change in the method of recording. Of more concern is the possible contraction in the range of some species across the site, even though the habitat remains suitable for them. Dingy Skipper was only recorded in 9 sections (2104 – 16), Small/Essex Skipper 17 (25), Orange Tip 4 (18), Small Copper 1 (3), Dark Green Fritillary 9 (13), Marbled White 27 (30), Gatekeeper 25 (29), Ringlet 27 (30), Small Heath 24 (27) and Duke of Burgundy 2 (3). No Wall were reported either from surveys or casual sightings, and this is indicative of its decline at all of its previously known inland sites. The Leckhampton Hill side of the commons continued to have the greatest number of species present and seemingly the most stable populations with minimal fluctuations recorded over the 3 years (+ or – 3 species). 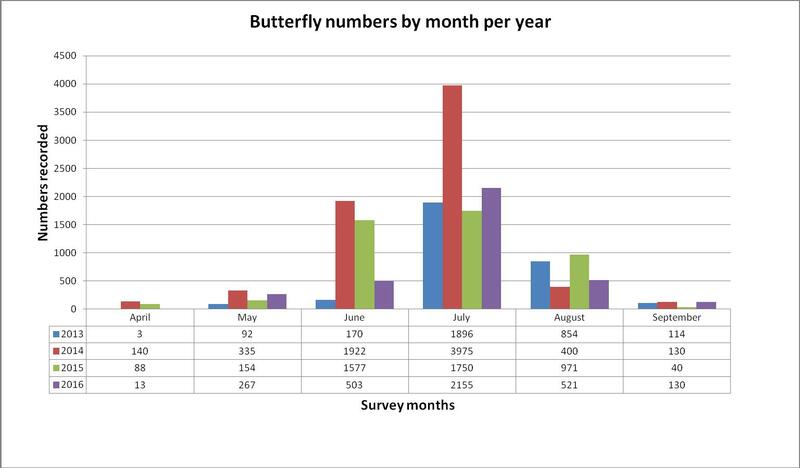 In conclusion, the numbers of butterflies recorded were down on 2014, but generally the winners and losers were in line with local trends when compared to other regular survey work done in the Cotswolds in 2015. However, it was evident that the number of flowers providing nectar sources to the adult butterflies has reduced though a combination of factors: the weeds of disturbed ground that were so abundant following the fencing and walling work were less common in those areas and the number of cattle grazing has increased, thereby increasing the amount of vegetation, and with it the flower heads, consumed and therefore depriving the butterflies of valuable sources of nectar and larval food. What effect this has or will have on the success or otherwise of breeding populations on site it is too early to say. After the slow and late start in 2013, the 2nd year of regular monitoring began early. The weather encouraged all the recorders out and about from the first week in April, and the hibernators (Brimstones and Peacocks) were already flying. 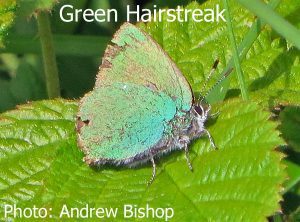 On 16th April, the first Green hairstreaks and Orange tips were sighted, almost 3 weeks earlier than 2013. 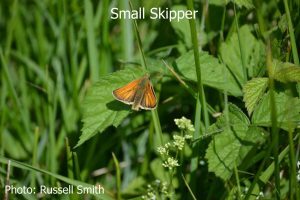 As the weather continued fine and warm, Dingy skippers were flying by 3rd May (which was just more than 3 weeks earlier) and by mid-month were recorded in good numbers, along with Common blue and Small heath. 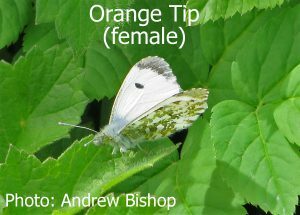 The trend of early emergence compared with last year continued with most of the remaining species, but with a corresponding early last sighting date, with few if any Marbled Whites and Ringlets surviving beyond the end of July, when last year they were seen until the end of August. 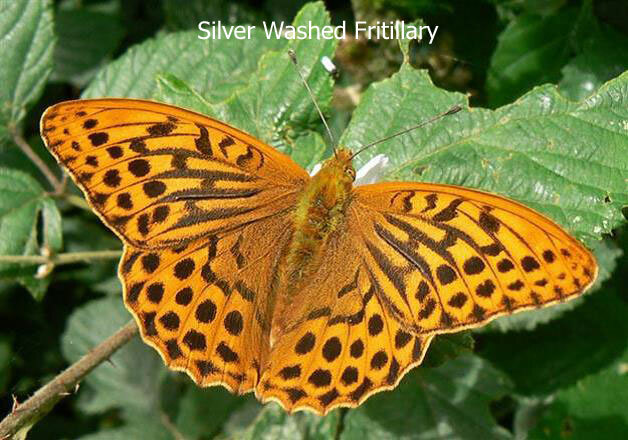 The highlights of the season must be the sighting of Silver-washed fritillary and Adonis blue, the former initially not on the survey route. However, it was subsequently seen on various days by 3 different recorders on the Leckhampton Hill section just above the Bridge car park on Daisybank Road, with a minimum of 4 individuals present. Whether the single Adonis blue was there naturally or by introduction cannot be determined. It has in the past been recorded spasmodically across the site, but never appeared to successfully establish a viable colony. 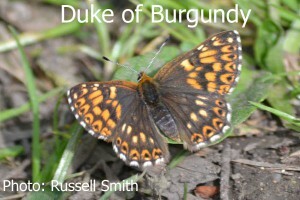 The Duke of Burgundy was again recorded on Charlton Kings Common, mainly in the area above the golf course. At the height of the flight period, a timed count was done by a member of Butterfly Conservation, during which a total of about 30 were seen, which was an excellent result, even though some may have been counted more than once. A disappointingly small number of Wall browns were recorded during surveys, though some were seen by me during casual walks around the hill, so it is still present. After a bumper year in 2013, Dark green fritillaries were not quite so numerous, but were still seen in most previous locations, as well as some new ones. Numbers of Chalkhill blues were also lower, and this was in line with trends on other Cotswold sites. 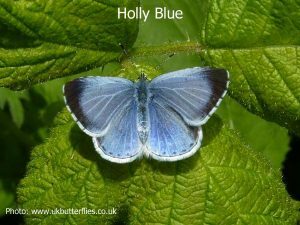 A single Small (Little) Blue was seen in a new location, but as none of the larval (caterpillars) food plant is known from there, it was presumably what is known as a wanderer, having flown in from elsewhere. Migrant species were more common this year, with several records of Painted ladies and Red admirals. As not all the records have been received and analysed, just the highlights of the season are recalled here. The comparison of population numbers between the two years will not be able to be made due to a change in the method of recording. But the impression is that there have been some winners and some losers – Marbled Whites up but Gatekeepers down. The reasons for this cannot be determined but are likely to be many and varied such as weather or management related.